Hello, and welcome to another edition of Latest Developments! This week is the five-year anniversary of me joining Wizards of the Coast as a contractor on the development team. My official hire date was six months later when I got converted to a full-time employee, but I still like to count it from the day when I first passed through the doors and started living a year in the future, developing Magic sets. I've come a long way in those five years, from really struggling to keep my head above water and trying to learn how to do what we do. At this point, I have completed work as a development team member on eight Magic sets (Dragon's Maze, Conspiracy, Magic 2015, Dragons of Tarkir, Shadows over Innistrad, Eternal Masters, Aether Revolt, and "Soup"); I have been a team member on four design teams (Dragons of Tarkir, Shadows over Innistrad, Amonkhet, and Hour of Devastation); and I have led three development teams, along with another I'm working on now (Magic Origins, Eldritch Moon, and Ixalan). I even got the chance to lead the design on Modern Masters 2017 Edition. I'm not sure when I started if I had any idea of just how much amazing stuff I was going to get the chance to be a part of, and I certainly had very little idea about what exactly I was going to be doing on a daily basis. Today on Latest Developments, I want to share some of the skills I have learned from working on Magic sets—skills I think can easily be translated to other collaborative creative projects. Without further ado, here are four lessons I've learned over the past five years. Listening really is paramount. Something I think we all do—maybe because of conditioning from years of school or maybe just as a part of human nature—is listen just enough to know when the other person has stopped talking. This leads not to being able to answer concerns or questions that someone else has, but instead to just trying to rebut them. That might be fine enough when dealing with a random classmate or someone you may never see again, but for people with whom you need to have an ongoing relationship, that kind of behavior can be poisonous. If you are someone who is known to do that, then others may similarly feel like not engaging with you, or may end up doing the same not-listening to you. At that point, your own points are going to end up getting lost in the same way that others' points are lost on you. What's important to understand, when working in these kinds of collaborative projects, is that everyone's opinions are valid—even if their solutions are not. In fact, people are much more accurate with their ability to tell you whether or not something is working, fun, or off-putting than they are with coming up with the solutions. When someone has concerns, you need to listen to them and take them to heart even if you don't end up agreeing with them. Ultimately, when we make Magic sets, we don't make them for ourselves; we make them for our audience—all of you. 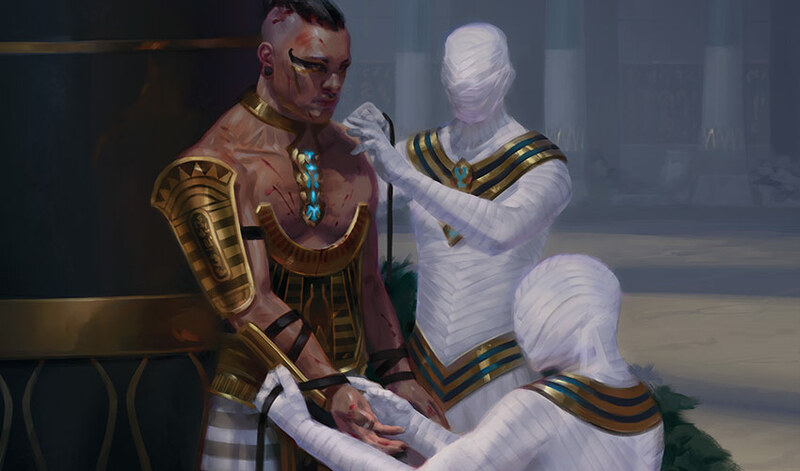 If someone else working on Magic has a concern about a mechanic, part of the story, or a card, they represent a voice within the community that will have that same concern. We can't make everyone happy, but ultimately we want to try to address as many concerns as possible and at least have considered many of the problems people will have with those items. The goal isn't to design by committee but to get enough opinions from different sources that the lead of a project can make the most informed decisions possible. This is one many people have problems with early in their tenure within R&D. Not me, but that may have been bravado getting the better of me. I put this after "listen" because speaking up before listening is very bad in collaborative projects. As member on a team, it's incredibly important to make sure to give your honest opinions on things and say something when you believe something strongly. It is entirely possible, no matter how mundane your point, that the other people on the project just haven't thought of it yet. Even if it seems obvious, there is a lot of stuff up in the air, and it's possible that a thing has simply been overlooked. When working on Magic sets, this comes out in a number of ways. Two-card combos in Eternal formats frequently come up in meetings, and if it seems like a real problem, we try to fix it quickly. Sometimes it is a combo in Standard or a really bad rules interaction that we want to be careful on. Other times, it could be something with the name or art that is unintentional but may have bad connotations. There are just so many moving parts in any Magic set, and the set's lead literally can't think of every single one of them. Having team members who can try to catch things that fall through the cracks—and trusting that they will point those things out when they see them and not as footnote months later—helps to build good working relationships. Now, there is a big difference between speaking your mind and getting your way. Letting people know how you feel or what concerns you have is almost always useful. Not letting the rest of the project continue until your demands have been satisfied only leads to nothing getting done, ever. Much like before, the goal for any creative project shouldn't be that it is led by committee, and if someone attempts to get their way on all decisions, then others will as well, and everything will get muddy. The challenge of collaboration is the part where you actually need to work with other humans to get things done. That, naturally, means there is going to be some kind of conflict. Be very suspicious of any environment where there isn't some amount of conflict—that usually means that questioning the status quo is quashed fast enough that people have learned to keep their mouths shut. Or that people with different opinions quickly find their way out. Neither is a good place to be. That doesn't mean that people are arguing all the time, but people should feel able to speak their mind and know their opinions are heard. A group of passionate and skilled people is just going to have differences of opinion on many topics for which they have expertise, and ideally you can use those various opinions to get a better end result. The hardest part about being passionate and disagreeing with people is knowing which battles to pick; you really can't pick all of them. If you do, you are going to burn out, and people are generally going to feel like you are trying to control everything. Your hit rate only needs to be so high on all these arguments for people to have confidence in you. It's very easy to get the reputation of "the boy who cried wolf." Then you aren't helping anyone—especially not yourself. It's much better to only really try to fight battles that you think are very important and that you have some amount of unique insight on and the ability to explain your points. This happens a lot when making Magic sets. Wizards of the Coast has over 400 people working in our home office, and while not all of them will touch a Magic set while it is being worked on, the number of people who do is very high. Many of them will make decisions that I might personally disagree with when I am leading a set, but ultimately I am not the smartest or most skilled person on every subject in the world, and it's important to let other smart and skilled people use their expertise to make decisions. Are there things that I could've fought that would've ended up better? Probably, but there are plenty of things I had little to no faith in that also ended up really good. It's easy to think only of the first category and ignore the second, even if the second happens much more frequently. A while before I got into the pit, Matt Place worked there. One of his sayings, so I have been told, was "Have you ever been wrong before? Have you considered that this may be one of those times?" While it is a somewhat flippant comment, it is just true. It's easy to forget that that all the smart and passionate people around you also may have good points, and many of them may just have put more thought or work into something than you. They may also have unique insights that you don't. This lesson was a hard one for me personally and one I probably still need to put some work into. I've chosen many really dumb hills to try and die on in my life, and I am happy that I have managed to make my way off of most of them. Whenever you are working on a big project, especially a creative one, there are going to be a lot of times when you are going to be in a position where you need to make a decision and you are not sure of the outcome. That's good—if you were sure of everything before doing it, then whatever you are working on is likely to be boring. People are going to have seen it before. On the other hand, if whatever you are working on is too far out there, people are going to have a hard time relating. It's important to know what the limits you are playing with are and how far to go. When working on Magic sets, it usually means only changing so far away from the baseline at any given time. While we don't make a lot of sets that are as out-there as Legions or Alara Reborn anymore, we certainly could—but there would need to be a good reason to do it. We would also want to make sure there was a way to balance things out in a fun way. So, if we were to make a set with all artifacts, we would want to figure out how to make many of the artifacts have colored costs; the set would just be too complicated to draft and soupy (everything running together and feeling the same) if we try to ignore color identity entirely. What's important in the end is that you take risks in a measured and purposeful way. Risks should be experiments, and you should understand that there is a chance that they won't work—so always have a backup plan. And have some idea of what you are testing. There also needs to be a general understanding with the people you are working with as to what the risks and the metrics for success are. It's very easy to look back on a project at the end and create metrics at that point to determine if you succeeded or failed. The reason you set them before is so that you can't cherry-pick the data afterward. That's it for this week. Join me next week for another edition of Latest Developments, when I talk about how to deal with change.